We have seen so many sculptures like the famous Pieta, The Thinker and others. 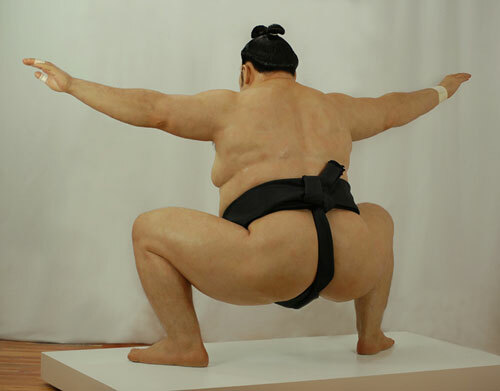 Sculpture is a three dimensional visual art that can be done on various materials. It had started a long time ago in Ancient Greece and had survived up to this day. But unlike the classical sculptures, today’s works have improved not just on the materials used but also on how each one looks. Yet, the sculptures from yesterday remained an inspiration to thousands of people today. 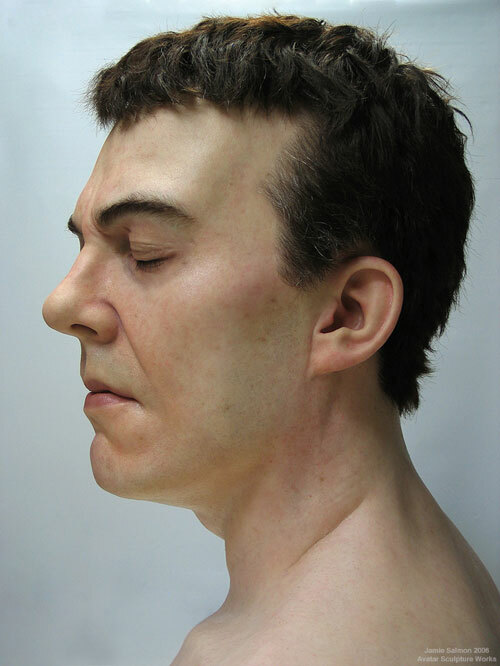 These days, artists can already use silicone as a major component since it can look finer and would make it a lot easier for them to add some relevant details. 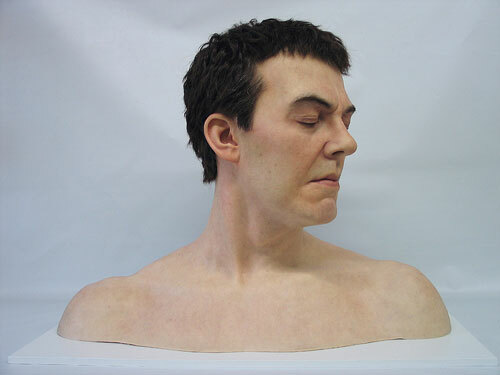 The works of Jamie Salmon are made out of silicone rubber. 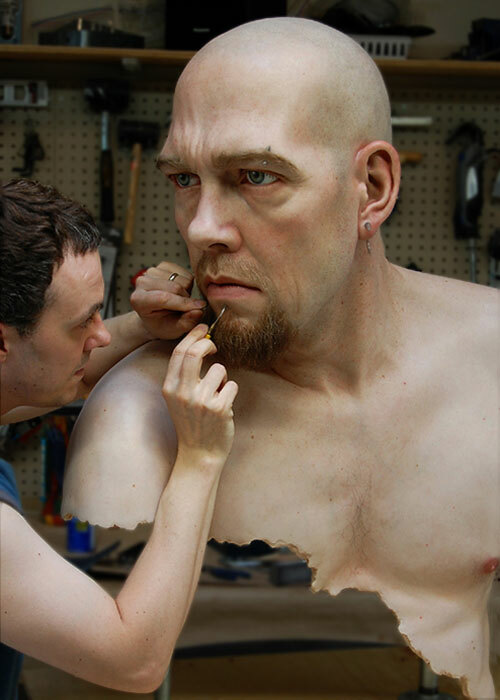 He also use acrylic, fiber glass, pigment and hair in order to add a more realistic touch to his sculptures. 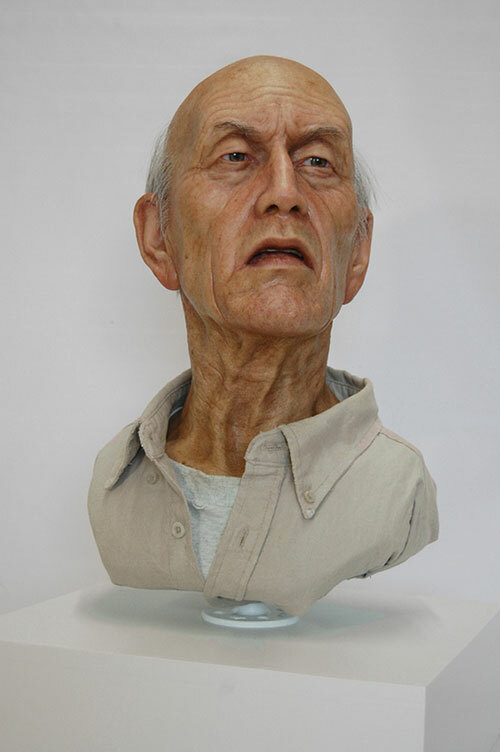 Jamie Salmon is a self taught contemporary sculptor who specializes in hyper-realistic sculpture both figurative and portrait. 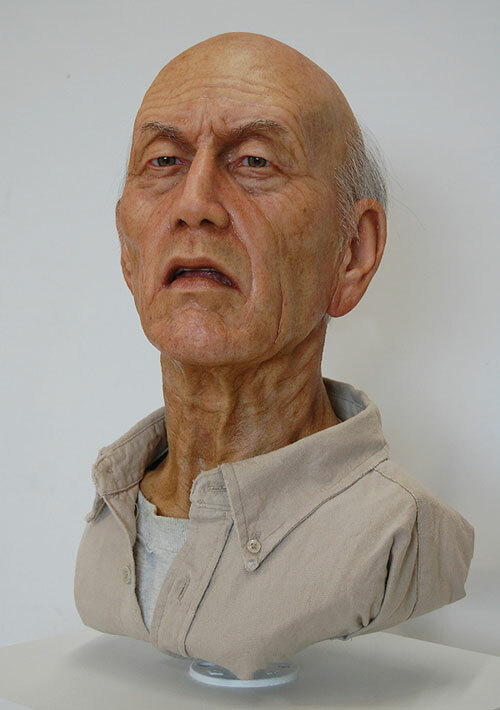 He had worked as an artist and sculptor for the movie effects industry. Salmon said that the he makes sure that his work appear “as strong as possible” in order for it to tell a story or to move the people. 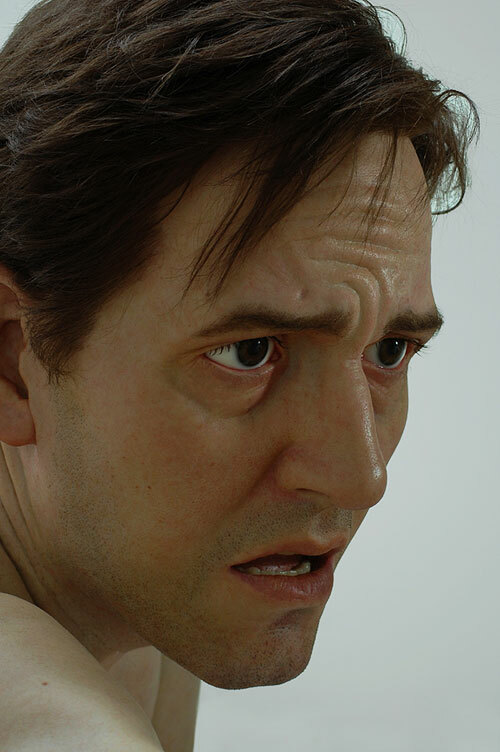 He also said that most “hyper-realistic arts tries to reach an ultimately unattainable level of perfection” but is not the primary goal of the work. 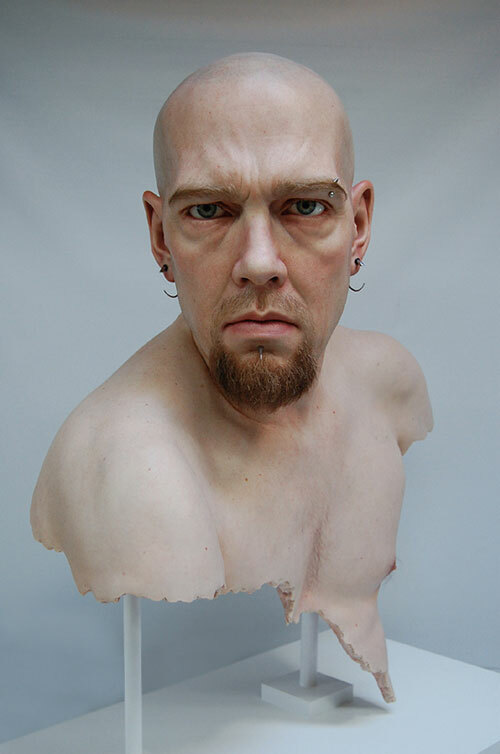 His work has a heightened degree of reality that aims to convey a real sense of emotion. 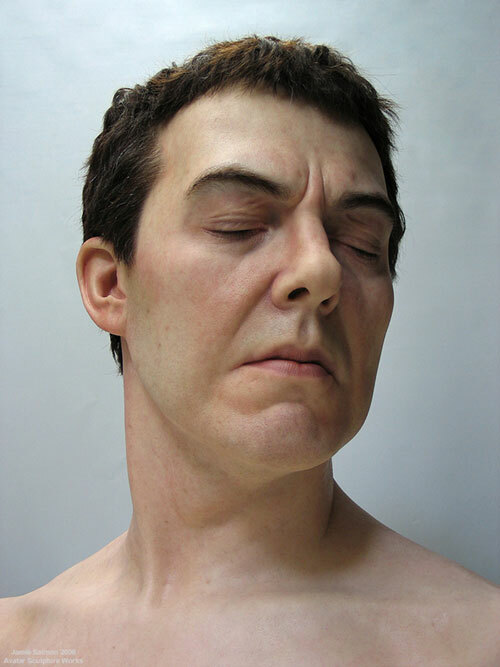 These realistic sculptures can let the viewers confront ideas on reality and would move them to look deeper on what the art works are trying to tell. So, let us take a look at the works of Jamie Salmon so you can understand the level of realism we are talking about here. Scroll down and take a glimpse at some of his master pieces. 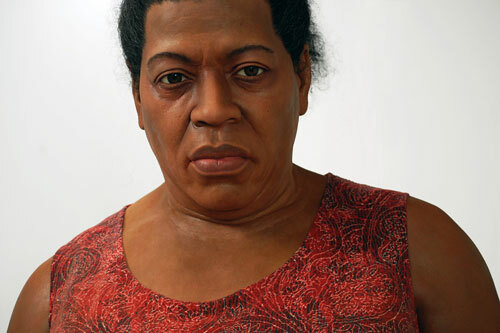 A big fat black woman with a seemingly angry face is featured in this sculpture named Wreckage. On her feet are wrecked frames maybe that of her family. The work is like showing a sad story about a broken family. Salmon is standing next to it which will make you see how big the sculpture is. Notice the frame on her hand with broken glass and look at how detailed her body parts are including the fat on her belly. Looking so real right? 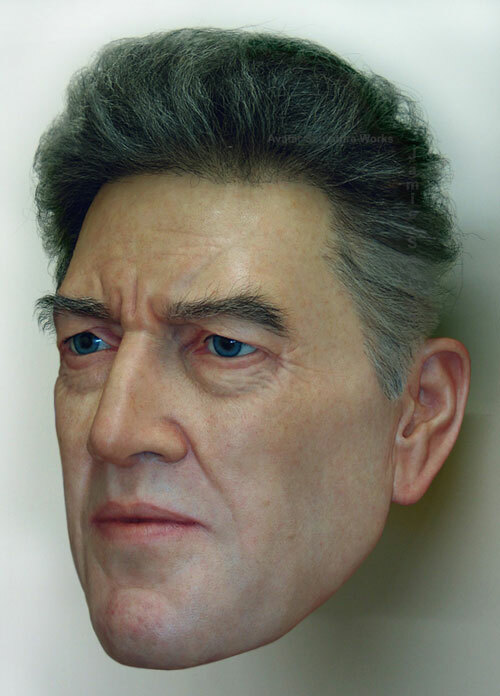 You can even sense the emotion of anger and sadness in her face even if it is merely made out of silicone, pigment, fiberglass, acrylic, fabric and hair. Even the facial lines are well done. The eyes really looked so real with a few red lines inside. One look at this one will really make you think that it is a portrait of a real woman. 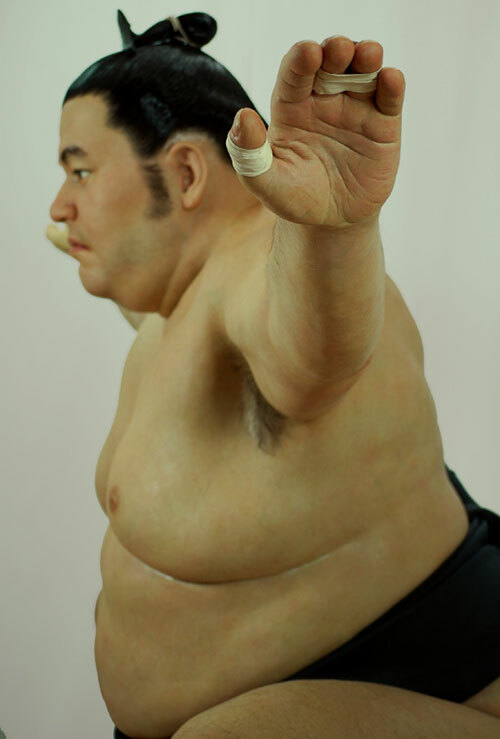 Look at how real this sumo wrestler is! Every detail is carefully done even the hair in his armpit. 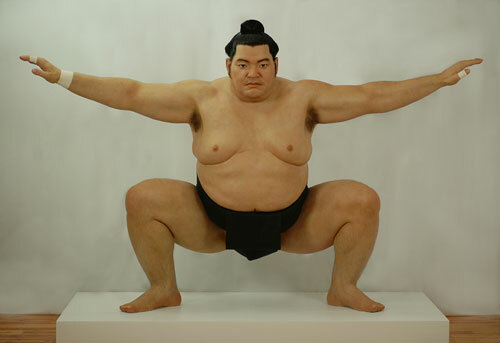 The back portion of the sumo wrestler showing detailed lines on his skin like the spinal and elbow portions. A closer look on the side part where you can see the palm lines and a few hairs on his arms and legs. Very realistic indeed! 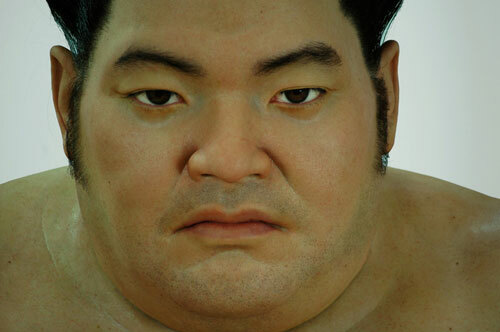 Now that is the face of the sumo wrestler. He looks serious with that Asian eye of black. Even the hairs on the face are perfectly done. 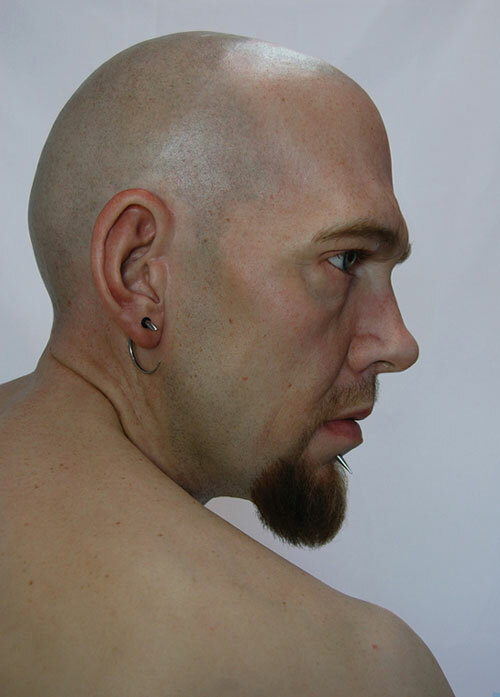 A man named Chris is seen in this art work with a fragmented body. Exposing the back part wherein you can even see some freckles like a real person. His bald head also looks like a real human’s head. A closer look a the face where you can see facial lines, hair and his accesories. The planting of every hair on his face for the eyebrows and mustache is really superb for it made it appear more realistic. This is Salmon pinching a hole near the chin to place a facial peircing which is also seen on his brows and ears. The entire naked body of a man is featured in this sculpture with arms reaching to the open air as if to grab something. 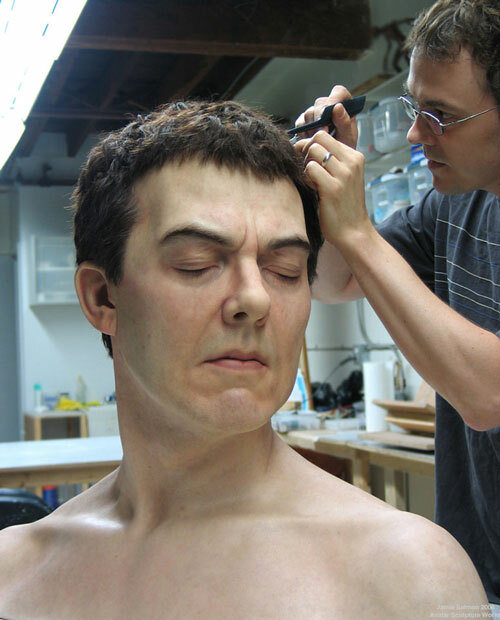 The artist is working on the hair, you can also notice that there are hairs on certain parts of his body where it ought be seen making it appear real. The expression on his face shows longing, fear and worry of being desolated. The creased forehead, slightly opened mouth, and worried eyes made it look like a real man. This is the rear part of the artwork. See how Salmon carefully made the entire sculpture with hair details, skin details and even nails on his feet. A real old man? Nah. 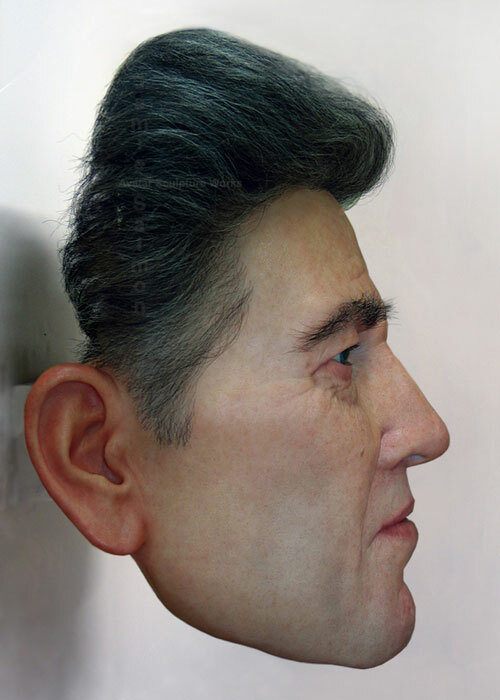 This is another sculpture made from silicone,acrylic, pigment and hair. The entire art work really bears the look of an elder man from his facial lines, hair color and also the clothing he is wearing. You can really appreciate how Salmon have placed all the details to this elder man.The creased skin parts are really that of an old person. You will feel like when you touch it, it would be like an old man’s skin. 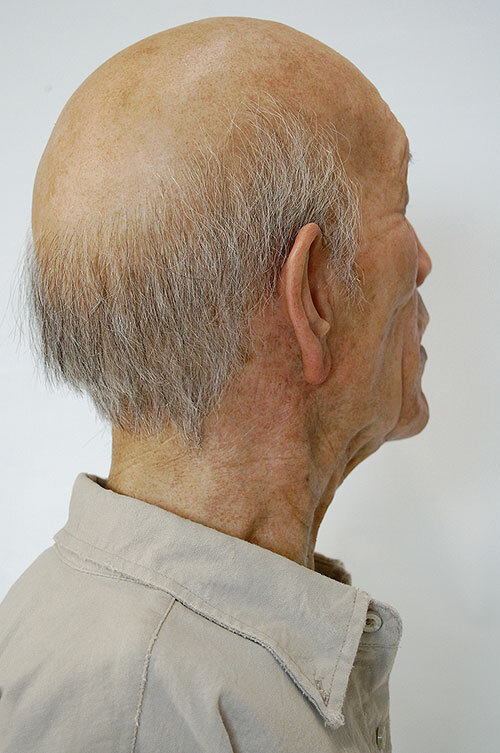 The back part of the old man where you can see combined black and white hair but more white hair. The bald part also look real. From the name itself, this one is his own portrait with eyes closed. 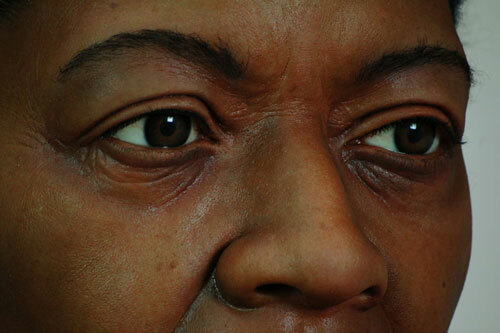 Like the other sculptures, this one also bears the details of a real man’s face including the crease on the eye and brow part. His face looked well-shaved like how a real man looks after shaving. Also notice the highlights on his hair making it look like himself. This is Salmon carefully fixing the hair especially the curl parts to make it appear real. A mature man with blue eyes and round face is seen in this artwork. Unlike the other works, this one is solely made of the face. 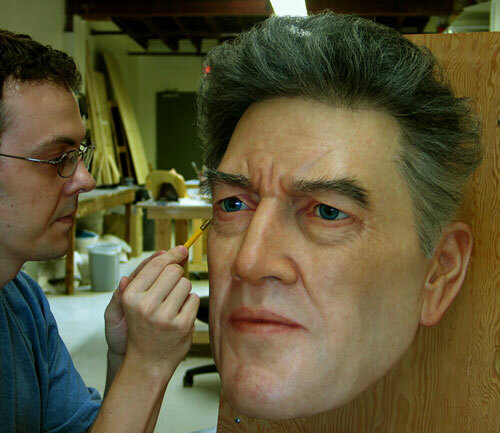 One has to be very meticulous in creating realistic looking scupltures since everything has to be on the right proportion like the face of this Director. On this side, you will see that it is mounted on the wall. You can also get a closer look at the hair which was neatly done. Salmon working on his eyes adding a few lines for a more detailed look. 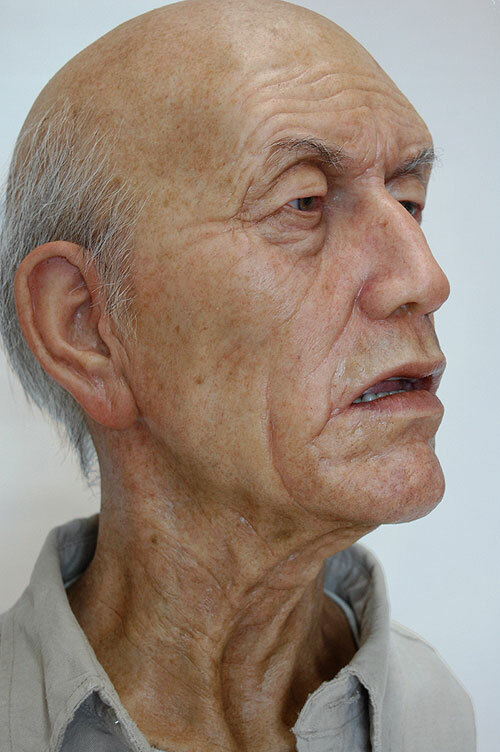 Maybe after seeing the work of Jamie Salmon, you are still wide-eyed with how realistic these sculptures look. 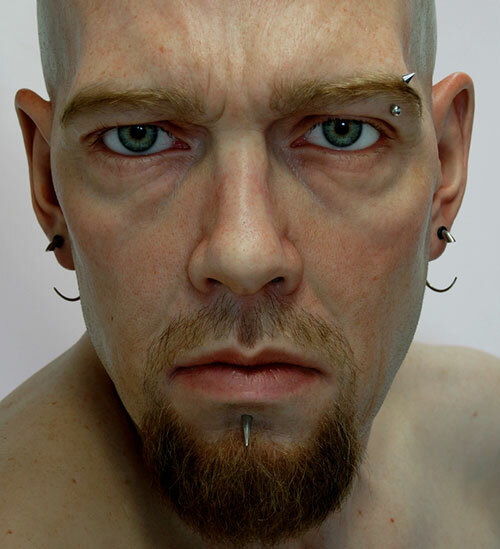 It wouldn’t be easy and simple to create hyper-realistic sculptures like that of Salmon’s works. But aside from the manner of creating it, what is more important for the artist is the story that the viewers could see on every art work. Well, you will surely agree with us when we say that it would take a genius to create art works like this. Apart from the realistic touches and details, Salmon has also made sure that each one is scaled well so that it will not look distorted. Even the size of the eyes, ears, width of shoulders and others are carefully taken into consideration. A big “wow” would not be enough to express how superb and excellent these sculptures are! What!? Wow… The is unbelievably amazing. And I love it. 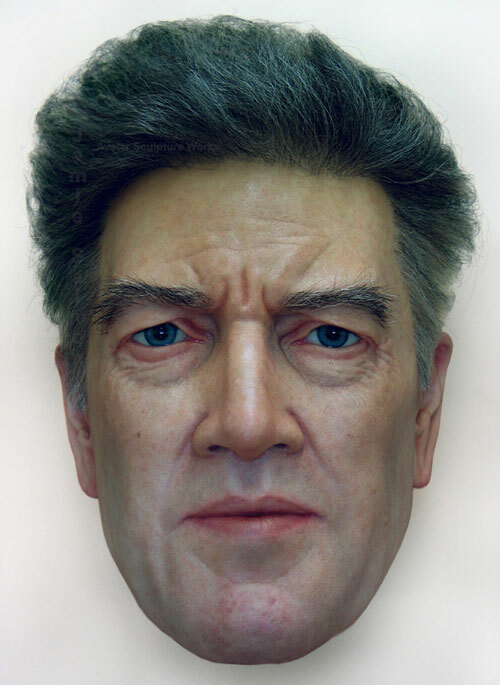 It should probably be mentioned that the piece entitled ‘The Director’ is of David Lynch. What an amazing talent. Kinda makes me envious. I wish I could do that!